Maybe not every one, but, from my conversations with business owners and entrepreneurs across the country, it is inescapable that ObamaCare is killing job creation and smothering the recovery. And now we have a study that shows the correlation: The Heritage Foundation’s James Sherk compared job growth before and after the health overhaul law passed in March of 2010. Job creation has basically flatlined. Before the health overhaul law passed, the number of new jobs was soaring. Private-sector job creation had improved by an average of nearly 68,000 a month in the 15 months before April 2010. But in the 15 months since then, it has slowed to an average of 6,500 a month. “We’ve frequently heard strong comments to the effect of ‘my company won’t hire a single additional worker until we know what health insurance costs are going to be,'” the Fed president said. A trillion-dollar “glitch”: And the cost of ObamaCare to taxpayers keeps rising. The Hill carried an important article Thursday about “a glitch” in the health law — one that could mean a trillion-dollar underestimate of the true cost of ObamaCare. Under the law, employees can obtain subsidized health insurance if their employer plan is “unaffordable,” meaning that it costs more than 9.5% if their income. Let’s take a worker who has been getting a family health plan through her job. Apparently when congressional scorekeepers analyzed the bill before it passed last year, they decided that if the health plan that the employer was offering for an individual was affordable to the worker, that the worker wouldn’t be eligible for subsidies in the exchange. But what if the family plan the employer offered cost 20% of the worker’s salary? Too bad. The scorekeepers assumed she wouldn’t be eligible for subsidies. But if employers drop coverage completely, pay the federal fine, and send their employees to the exchanges, then their employees will be eligible for subsidized coverage. In a study last year, former CBO director and now president of the American Action Forum, Douglas Holtz-Eakin, says that as many as 35 million more people will flood into the exchanges, driving up the cost of ObamaCare by $1 trillion or more. So we have a trillion-dollar “glitch” in ObamaCare’s cost. Repeal and replace, anyone? Higher costs for seniors: One thing is clear from the debt ceiling controversy swirling in Washington: There is absolutely, positively no way to solve the debt problem unless we get entitlement spending under control. And ObamaCare compounds the entitlement problem by piling trillions more debt obligations on top of the mountain of debt we already have. One of the most deceptive budget gimmicks on the debt negotiating table in Washington right now is one that would pretend to reduce the government’s deficit by increasing drug costs for seniors. A proposal by Rep. Henry Waxman (D-CA) and Sen. Jay Rockefeller (D-WV) would require drug companies to pay a rebate to the federal government for prescription drugs sold through Medicare Part D for low-income seniors. President Obama has endorsed the scheme. It’s basically a tax that drug companies would have to pay to provide drugs to low-income seniors who are eligible for both Medicare and Medicaid. But Doug Holtz-Eakin and his colleague at the American Action Forum, Michael Ramlet, show that the rebates would translate into higher costs for other seniors in their new paper, “Cost shifting debt reduction to America’s seniors.” They find the scheme could increase Medicare drug plan premium costs for up to 17 million seniors by as much as 40 percent. Pharmaceutical companies already are required to pay rebates to states for the right to sell their products to Medicaid patients, and it has been demonstrated that this increases prescription drug costs in the private market. The latest plan for Medicare drug rebates would only add to the “tangled web of cost shifting” in the U.S. health sector, they explain. This rebate tax is not a way to cut government spending but is simply a ploy to shift higher costs to seniors. Congress should look elsewhere for real savings rather than resorting to gimmicks that will trick seniors into picking up the bill. Former CBO Director and American Action Forum President Doug Holtz-Eakin walks through the liberal plan to achieve savings through mandatory Part D rebates. Holtz-Eakin’s new study reveals this plan does little to help Americans and will drastically increase the cost for seniors from 19% – 39%. Health Secretary Kathleen Sebelius testified before two hearings in one week about the controversial Independent Payment Advisory Board (IPAB). She did everything she could to downplay its powers. But IPAB symbolizes everything that is wrong with ObamaCare — taking power away from doctors and patients and putting it in the hands of elite experts who have virtually no accountability to voters. And IPAB will be charged with cutting payments even more than current law already does in order to reach ever-declining statutory targets. Unless Congress can muster super-majority votes to come up with its own cuts to reach the same targets, the dictates of these unelected technocrats will carry the force of law. 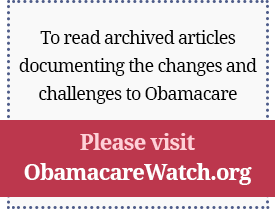 Health Insurance Exchanges: What If They Issued 347 Pages of Regulations and Nobody Cared? Grace-Marie Turner will participate in an interactive debate on repealing PPACA at 7:30pm on Wednesday, July 27.